Whether they are exploring new teaching methods, organizing community service projects or participating in international sporting events, students across Esol Education schools are always up to something exciting! Browse through these articles, or download STRIDES, our official newsletter, for in depth coverage of the latest happenings at our schools. For press inquiries, comments, research or data please contact our communications team on communications@esoleducation.com. The Middle School Advisory Program and Student Council at AISC recently kick-started an initiative to address the overuse of water and the importance of drinking clean water every day. In advisory, students learnt about the scarcity of water around the world. They read articles and watched videos about women in developing countries, who spend hours of their day carrying water for their families. This prevents these women and girls from attending school or working to earn money. Many times, the water they carry is contaminated and may make their families sick. All Middle School students surveyed their own water usage by recording their habits over a 48-hour time period and then averaging their daily water usage. 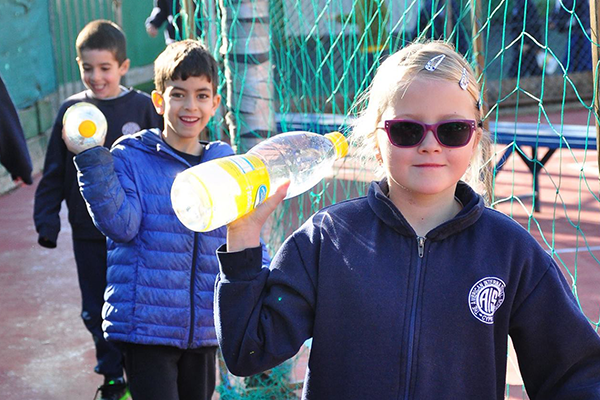 In order to better understand how precious water resources are, student engaged in an elementary and Middle School “Water Walk.” Groups of students were given garbage pails to fill with water, representing only a fraction of the AISC daily water usage. Students had to carry two, three and four liter bottles around the perimeter of the school before pouring the water into the garbage pails. The water was taken from the AISC pool and returned to the pool after the exercise. Students described the experience as “difficult,” and “tiring.” In addition to the “Water Walk,” the Middle School Student Council is working with the Grohe Company, who heard about our water project, and as a result, wanted to recognize the Middle School project by installing a high-quality water filtration systems that will allow student to quickly fill reusable water-bottles rather than purchase water in disposable bottles.